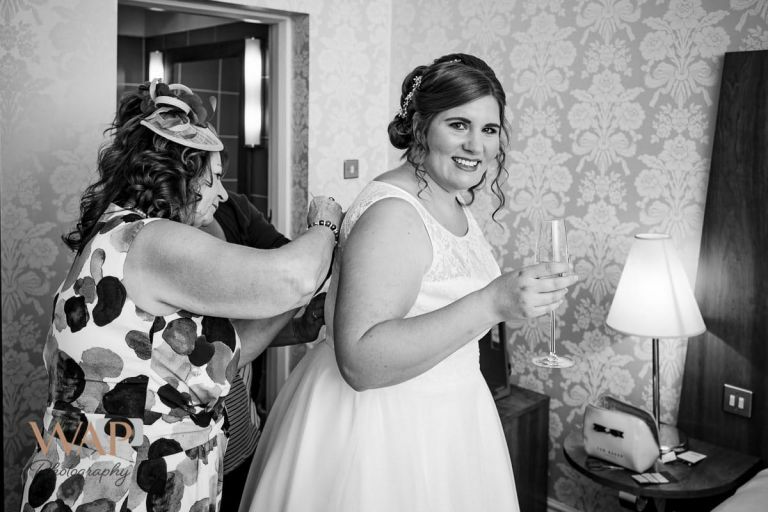 We recently had the opportunity to photograph Avril and Paul’s Solihull wedding at the Regency Hotel on the Stratford Road near Shirley. 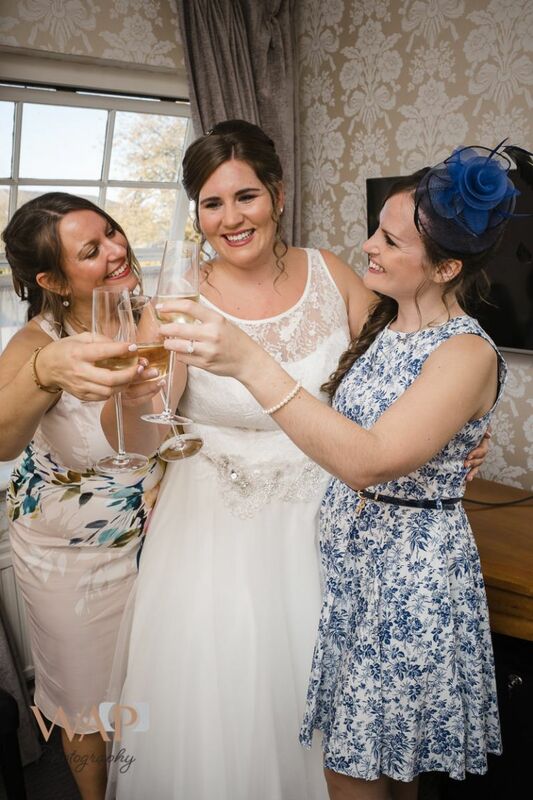 Avril was a really bubbly bride and her sisters Nina and Naomi were of a similar nature. It had all the makings of a fun day. Avril’s dress was fastened by a plethora of tiny buttons on the back with a loop that went over them. ( Sorry ladies I don’t know the proper dressmaker’s terms for such things) Her mother and her stylist displayed amazing talents with a crochet hook to get them all quickly fastened. Avril’s glass remained upright despite the frenetic work behind her and she didn’t spill a drop. 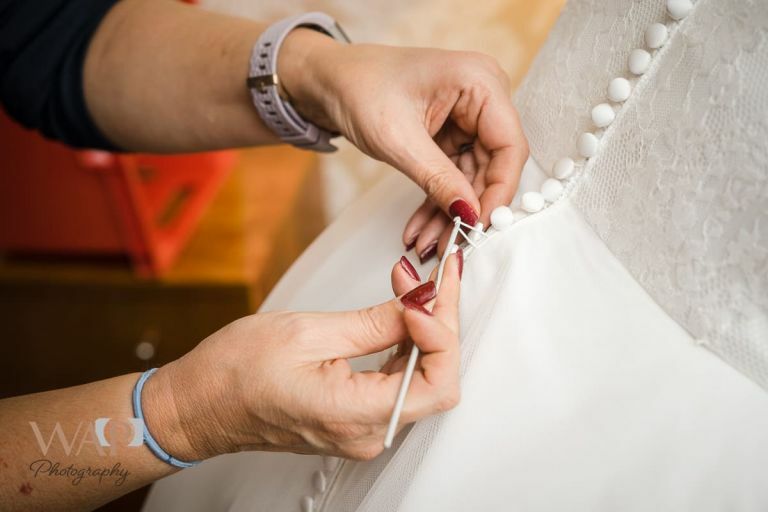 Expert hands fasten the dress. Avril doesn’t spill a drop. Whilst we were upstairs Andy was downstairs with Paul, using Morrissey’s bar, which was to be the reception room, as a location. Morrissey’s has a bit of an American feel to it and is great for a smaller gathering. Next, it was on to the ceremony. We like the room at the Regency Hotel as it gives us a bit of ability to move without disturbing anyone. 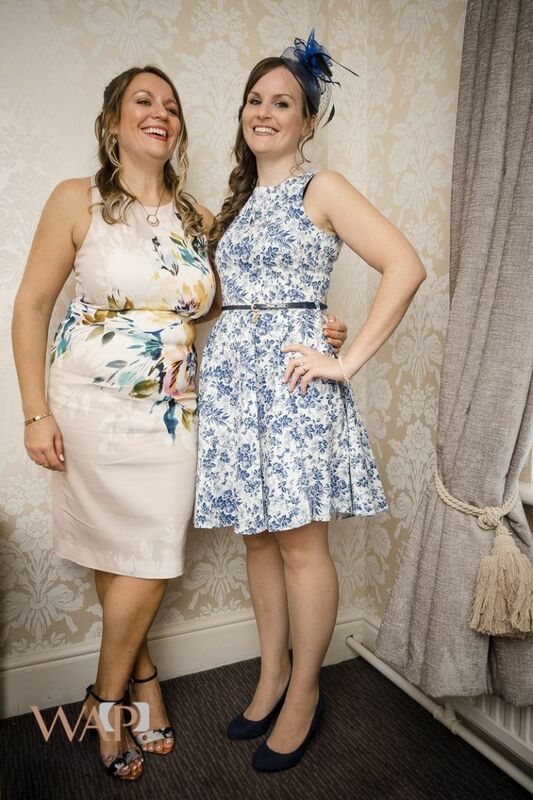 As always with a Solihull Wedding, the Registrars were very helpful to us allowing free rein so long as we didn’t disturb the solemnity of the occasion. Some of the looks from Avril during the ceremony were great, it was very much, “he’s mine now”. We took everyone outside for the formals and mother nature played ball with the lighting for us. Avril’s loving the just married time. During the gap between the ceremony and the reception, it was great to see the changing colours as the sun set quite early in the autumn sky. The first dance was a nice change from the frequently encountered “turning round slowly dance” as I once heard it described. It is a somewhat compact dance floor so it worked well. We finished off the evening at this Solihull Wedding with some sparklers outside. I don’t know about you but I’m sure that when I was child sparklers did sparkle and I used to feel the sparks hitting my hand. Today it’s more like a damp squib. Please leave a comment about your experience with them.